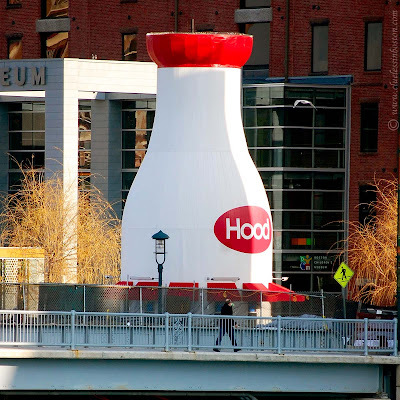 Hood milk bottle at the Children's Museum. hehe, that's a lot of milk :)! it is good they advertise milk insted of sweets or fizzy drinks! But the top was only a kind of a cardboard. So, one had to be sure to not leave the milk out there, in really cold weather, for too long. Or it would freeze. Wow! Great photo. My uncle was one of those milkmen that Mari-Nanci mentioned, for Borden's. He delivered in Mississippi so hardly had to worry about the milk freezing on the doorstep.